Welcome to our online store! | M and M Fabrics: Your Home for UltraSoft 100% Cotton Interlock, Ribbing, and Mally + Mac Baby Knits! M and M Fabrics: Your Home for UltraSoft 100% Cotton Interlock, Ribbing, and Mally + Mac Baby Knits! Our store is open for business! Use the “Shop” link in the menu bar to make your selections, We are working on improving the website, and we’re sure you will see many changes over time. 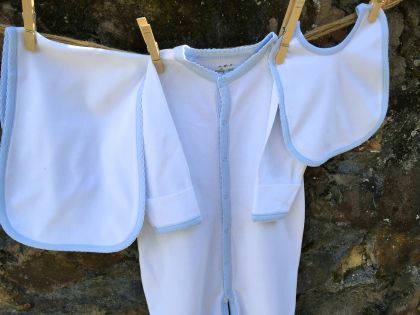 We hope you will love these baby accessories and garments as much as we do! The cotton used is so soft and hug-able that your baby and you will treasure it. The oversized double-thick blanket is absolutely luxurious. Matching 100% cotton interlock knit fabric and ribbing in pink, blue and white is available for your creative sewing projects. Payments are acccepted via PayPal and Amazon Payments and we offer flat rate shipping of $7.00. Sales tax added to orders shipped to Alabama customers. Wholesale customers please send an email to orders@mandmfabrics.com to get the information you need to open an account. M and M Fabrics: Your Home for UltraSoft 100% Cotton Interlock, Ribbing, and Mally + Mac Baby Knits! © 2019. All Rights Reserved.